Stay up to date on the latest Wild Turkey Farm news & results. 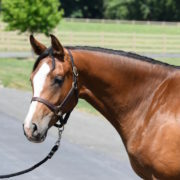 Congratulations, Anne Frankel, on the purchase of WT Legacy! 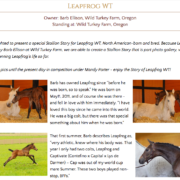 https://wildturkeyfarm.com/wp-content/uploads/2018/07/WT-Legacy-3.jpg 960 1200 admin https://wildturkeyfarm.com/wordpress/wp-content/uploads/2013/06/wildturkeyfarmlogo.jpg admin2018-10-02 17:13:052018-10-02 17:13:05WT Legacy — SOLD! WT Fine Affair — SOLD! Congratulations to the Mathias family on the purchase of WT Fine Affair (Crown Affair x Great Pleasure x Landgraf I), 2013 Holsteiner mare. https://wildturkeyfarm.com/wp-content/uploads/2018/08/WT-Fine-Affair-2.jpg 1516 1600 admin https://wildturkeyfarm.com/wordpress/wp-content/uploads/2013/06/wildturkeyfarmlogo.jpg admin2018-09-18 01:47:412018-09-18 01:47:41WT Fine Affair — SOLD! 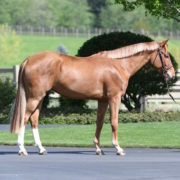 Congratulations to Jacob Fletcher and Stephanie Wyly on the purchase of WT Isla (Cascadello I x Heraldik x Lord)! https://wildturkeyfarm.com/wp-content/uploads/2018/08/WT-Isla.jpg 1117 1500 admin https://wildturkeyfarm.com/wordpress/wp-content/uploads/2013/06/wildturkeyfarmlogo.jpg admin2018-09-05 21:00:122018-09-05 21:00:12WT Isla — SOLD! 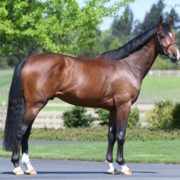 Congratulations to Jacob Fletcher on the purchase of WT Caden (Cascadello I x Catoki x Cassini II)! https://wildturkeyfarm.com/wp-content/uploads/2018/07/WT-Caden-1.jpg 793 1200 admin https://wildturkeyfarm.com/wordpress/wp-content/uploads/2013/06/wildturkeyfarmlogo.jpg admin2018-09-05 20:45:432018-09-05 20:45:43WT Caden — SOLD! 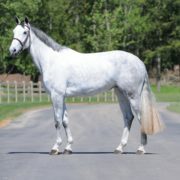 Congratulations, Sue Anne Young, on the purchase of WT Lionidas! 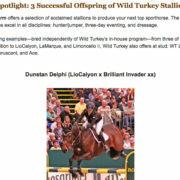 https://wildturkeyfarm.com/wp-content/uploads/2013/07/lionidas2.jpg 683 600 admin https://wildturkeyfarm.com/wordpress/wp-content/uploads/2013/06/wildturkeyfarmlogo.jpg admin2018-08-27 00:22:562018-08-27 00:22:56WT Lionidas — SOLD! 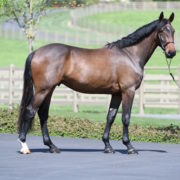 For the full story, please see Warmblood Stallions of North America here. 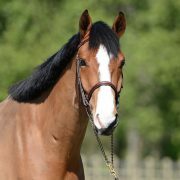 Congratulations to Heidi Smilde on the purchase of WT Frolique! https://wildturkeyfarm.com/wp-content/uploads/2014/03/frolique-1.jpg 2378 2880 admin https://wildturkeyfarm.com/wordpress/wp-content/uploads/2013/06/wildturkeyfarmlogo.jpg admin2018-07-31 01:52:322018-07-31 01:52:32WT Frolique — SOLD! 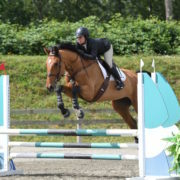 Congratulations to Victoria Hunt on the purchase of this very special 3-year-old, WT Hepburn! https://wildturkeyfarm.com/wp-content/uploads/2018/07/WT-Hepburn-1.jpg 925 1200 admin https://wildturkeyfarm.com/wordpress/wp-content/uploads/2013/06/wildturkeyfarmlogo.jpg admin2018-07-13 19:58:142018-07-13 19:58:14WT Hepburn — SOLD! 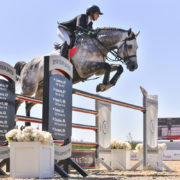 To read the full story on Warmblood Stallions of North America, please click here.